This post originally appeared here over four and a half years ago. I’ve updated the photos but the content remains the same AND this recipe is STILL a big family favorite! You must give it a try soon! 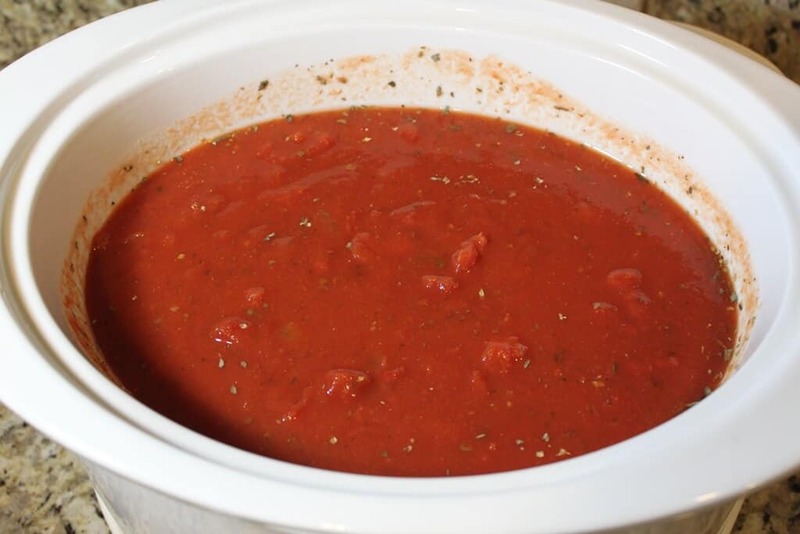 I’ve actually got a few favorite recipes but this Slowcooker Homemade Spaghetti Sauce is one of my family’s most favorites. 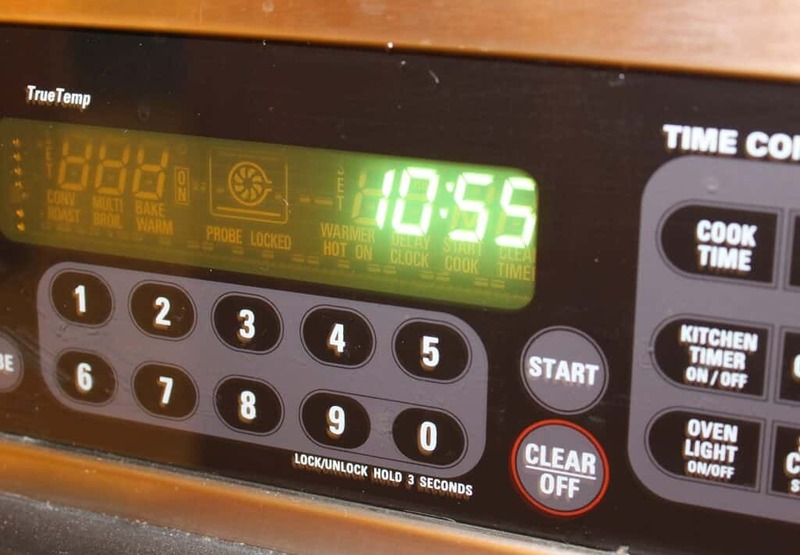 I originally found it in 30 Day Gourmet Big Book of Freezer Cooking Advantage Cooking software but I have changed it up just a bit over the years and my version is what I’m sharing with you here today. The spices are not overwhelming but have just the right blend to make this a super versatile spaghetti sauce that is family pleasing too! I love that I can throw all the ingredients together in the morning and at the end of the day all I need to do is boil up some pasta, add a salad and we’re good to go on dinner. I also love it because it makes A LOT! I always have enough to freeze at least enough for two more dinners and sometimes a little more. 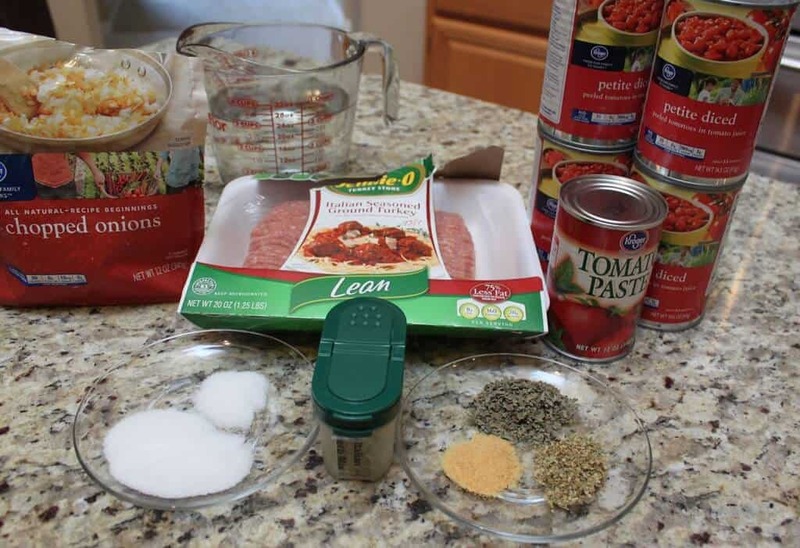 It’s great with or without the sausage and I even use it other recipes that call for a spaghetti style tomato sauce. And here’s my extra sneaky tip. I’ve made this overnight before. Yep, I put all the ingredients in the slowcooker before I go to bed then turn it on and it’s ready when I wake up. This is especially good when you want to make some up just to stock your freezer or plan to use it in another recipe the next day like lasagna or Parmesan chicken or eggplant. How’s that for easy cooking? And one more heads up….the original recipe called for Italian style tomatoes but I recently noticed that most brands have added sugar—high fructose corn syrup no less! Ok, why? All I want is the extra spices so I now add my own Italian spice blend and I’m good to go. We like to top ours with some freshly grated parmesan cheese that I keep in the freezer. 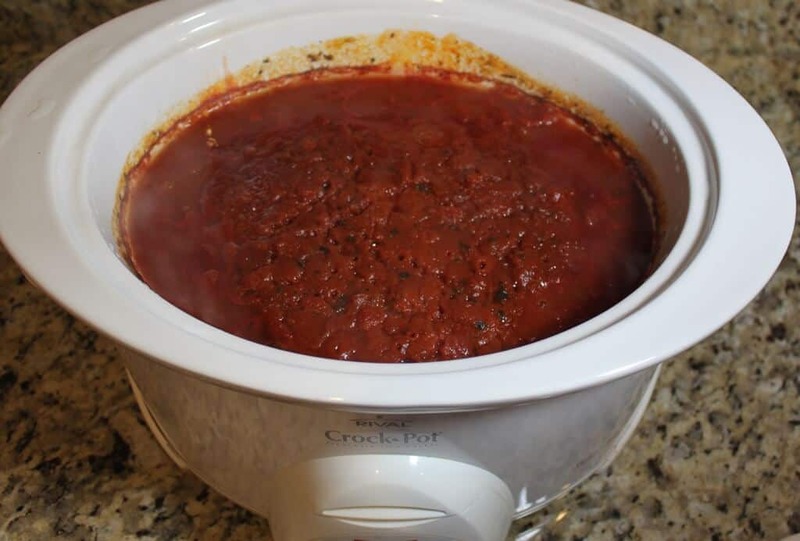 Combine all ingredients in slow cooker and cook on low for 6-8 hours. Freeze leftovers in separate containers in preferred amounts. Label and freeze. 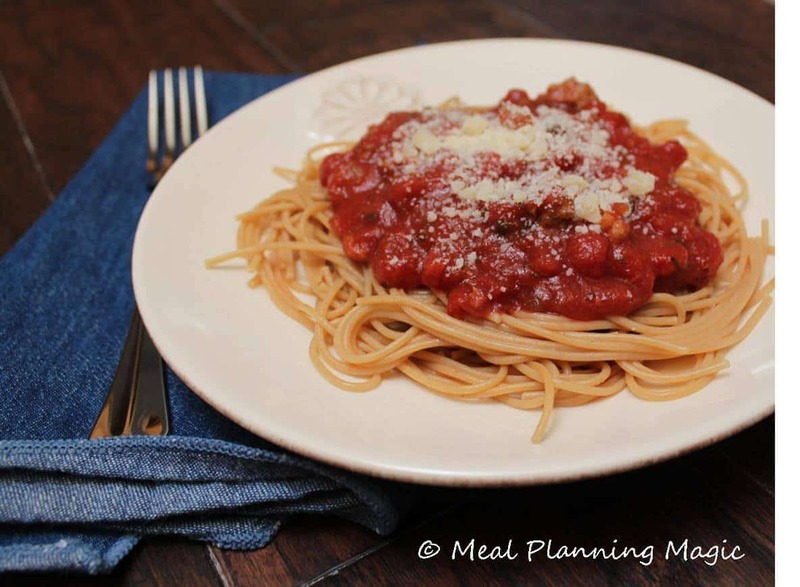 Making your own spaghetti sauce is easy and quick to put together. I used ground turkey (I forgot to take picture until after I had opened the package!). To save time, I also sometimes use frozen chopped onions–sometimes they are even cheaper than fresh! Just a few simple ingredients combined in the slowcooker is all it takes! Sometimes I cook the sauce overnight. See, I started this sauce right before I went to bed one night! When I woke up from cooking the sauce overnight, it was already to be portioned out into containers, labeled and put in the freezer! I’ve said it before, but I could literally eat spaghetti & red sauce every day. And I’ve been known to do just that–like for lunch and dinner both, for a whole week!